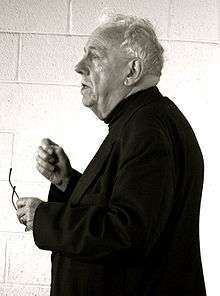 Alasdair Chalmers MacIntyre (born 12 January 1929) is a Scottish philosopher primarily known for his contribution to moral and political philosophy but also known for his work in history of philosophy and theology. He is Senior Research Fellow at the Centre for Contemporary Aristotelian Studies in Ethics and Politics (CASEP) at London Metropolitan University, and an Emeritus Professor of Philosophy at the University of Notre Dame. During his lengthy academic career, he also taught at Brandeis University, Duke University, Vanderbilt University, and Boston University. Macintyre's After Virtue (1981) is widely recognised as one of the most important works of Anglophone moral and political philosophy in the 20th century. From 2000 he was the Rev. John A. O'Brien Senior Research Professor in the Department of Philosophy (emeritus since 2010) at the University of Notre Dame, Indiana USA. He is also Professor Emerit and Emeritus at Duke University. In April 2005 he was elected to the American Philosophical Society, and in July 2010 became Senior Research Fellow at London Metropolitan University's Centre for Contemporary Aristotelian Studies in Ethics and Politics. Since his retirement from active teaching in 2010, he remains the Senior Distinguished Research Fellow of the Notre Dame Center for Ethics and Culture, where he retains an office. He continues to make public presentations, including an annual keynote as part of the Center for Ethics and Culture's Fall Conference. He has been married 3 times. From 1953 to 1963 he was married to Ann Peri, with whom he had two daughters. From 1963 to 1977 he was married to Susan Willans, with whom he had a son and daughter. Since 1977 he has been married to philosopher Lynn Joy, who is also on the Philosophy faculty at Notre Dame. MacIntyre's approach to moral philosophy has a number of complex strains that inform it. Although his project is largely characterised by an attempt to revive an Aristotelian conception of moral philosophy as sustained by the virtues, he nevertheless describes his own account of this attempt as a "peculiarly modern understanding" of the task. This "peculiarly modern understanding" largely concerns MacIntyre's approach to moral disputes. Unlike some analytic philosophers who try to generate moral consensus on the basis of an ideal of rationality, MacIntyre presents a historical narration of the development of ethics to illuminate the modern problem of "incommensurable" moral notions—i.e., notions whose value can not be reduced to a common measure. Following Hegel and Collingwood he offers a "philosophical history" (which he distinguishes from both analytical and phenomenological approaches to philosophy) in which he concedes from the beginning that "there are no neutral standards available by appeal to which any rational agent whatsoever could determine" the conclusions of moral philosophy. Indeed, one of MacIntyre's major points in his most famous work, After Virtue, is that the failed attempt by various Enlightenment thinkers to furnish a final universal account of moral rationality led to the rejection of moral rationality altogether by subsequent thinkers such as Charles Stevenson, Jean-Paul Sartre, and Friedrich Nietzsche. On MacIntyre's account, it is especially Nietzsche's utter repudiation of the possibility of moral rationality that is the outcome of the Enlightenment's mistaken quest for a final and definitive argument that will settle moral disputes into perpetuity by power of a calculative reason alone and without use of teleology. By contrast, MacIntyre is concerned with reclaiming various forms of moral rationality and argumentation that claim neither ultimate finality nor incorrigible certainty (the mistaken project of the Enlightenment), but nevertheless do not simply bottom out into relativistic or emotivist denials of any moral rationality whatsoever (according to him, the mistaken conclusion of Nietzsche, Sartre, and Stevenson). He does this by returning to the tradition of Aristotelian ethics with its teleological account of the good and moral persons, which was originally rejected by the Enlightenment and which reached a fuller articulation in the medieval writings of Thomas Aquinas. This Aristotelian-Thomistic tradition, he proposes, presents "the best theory so far," both of how things are and how we ought to act. More generally, according to MacIntyre, it is the case that moral disputes always take place within and between rival traditions of thought that make recourse to a store of ideas, presuppositions, types of arguments and shared understandings and approaches that have been inherited from the past. Thus even though there is no definitive way for one tradition in moral philosophy to vanquish and exclude the possibility of another, nevertheless opposing views can call one another into question by various means including issues of internal coherence, imaginative reconstruction of dilemmas, epistemic crisis, and fruitfulness. Probably his most widely read work, After Virtue was written when MacIntyre was already in his fifties. Up until that time, MacIntyre had been a relatively influential analytic philosopher of a Marxist bent whose inquiries into moral philosophy had been conducted in a "piecemeal way, focusing first on this problem and then on that, in a mode characteristic of much analytic philosophy." However, after reading the works of Thomas Kuhn and Imre Lakatos on philosophy of science and epistemology, MacIntyre was inspired to change the entire direction of his thought, tearing up the manuscript he had been working on and deciding to view the problems of modern moral and political philosophy "not from the standpoint of liberal modernity, but instead from the standpoint of ... Aristotelian moral and political practice." In general terms, the task of After Virtue is to account both for the dysfunctional quality of moral discourse within modern society and rehabilitate what MacIntyre takes to be a forgotten alternative in the teleological rationality of Aristotelian virtue ethics. MacIntyre's thought is revolutionary as it articulates a politics of self-defence for local communities that aspire to protect their practices and sustain their way of life from corrosive effects of the capitalist economy. Much of Whose Justice? Which Rationality? is therefore engaged in the task of not only giving the reader examples of actual rival traditions and the different ways they can split apart, integrate, or defeat one another (e.g. Aristotelian, Augustinian, Thomist, Humean) but also with substantiating how practical rationality and a conception of justice help constitute those traditions. MacIntyre argues that despite their incommensurability there are various ways in which alien traditions might engage one another rationally – most especially via a form of immanent critique which makes use of empathetic imagination to then put the rival tradition into "epistemic crisis" but also by being able to solve shared or analogous problems and dilemmas from within one's own tradition which remain insoluble from the rival approach. "It is most often to others that we owe our survival, let alone our flourishing ... It will be a central thesis of this book that the virtues that we need, if we are to develop from our animal condition into that of independent rational agents, and the virtues that we need, if we are to confront and respond to vulnerability and disability both in ourselves and in others, belong to one and the same set of virtues, the distinctive virtues of dependent rational animals"
Politically, MacIntyre's ethics informs a defence of the Aristotelian 'goods of excellence' internal to practices against the modern pursuit of 'external goods', such as money, power, and status, that are characteristic of rule-based, utilitarian, Weberian modern institutions. He has been described as a 'revolutionary Aristotelian' because of his attempt to combine historical insights from his Marxist past with those of Aquinas and Aristotle after his conversion to Catholicism. For him, liberalism and postmodern consumerism not only justify capitalism but sustain and inform it over the long term. At the same time, he says, "Marxists have always fallen back into relatively straightforward versions of Kantianism or utilitarianism" and criticises Marxism as just another form of radical individualism, saying about Marxists, "as they move towards power they always tend to become Weberians." It is this reality of modern individualism in all its forms that gives MacIntyre's critique its urgency and power. Informed by this critique, Aristotelianism loses its sense of elitist complacency; moral excellence ceases to be part of a particular, historical practice in ancient Greece and becomes a universal quality of those who understand that good judgment emanates from good character. It has been argued that MacIntyre's thought is unable to provide a coherent and effective model for a justifiable and politically stable political order, due to its neglect of political theology. MacIntyre converted to Roman Catholicism in the early 1980s, and now does his work against the background of what he calls an "Augustinian Thomist approach to moral philosophy." In an interview with Prospect, MacIntyre explains that his conversion to Catholicism occurred in his fifties as a "result of being convinced of Thomism while attempting to disabuse his students of its authenticity." Also, in his book Whose Justice, Which Rationality? there is a section towards the end that is perhaps autobiographical when he explains how one is chosen by a tradition and may reflect his own conversion to Roman Catholicism. Parallel recent developments in the methods of philosophical research, which carry resonances with MacIntyre's take on Thomism are witnessed with a modern approach to Avicennism (the historical legacies that were built upon the philosophy of Avicenna; Ibn Sina) as embodied in the works of Nader El-Bizri in connection with Islam, even though the orientation is phenomenological instead of being analytic, and the focus is on ontology rather than moral philosophy. 2002 (with Anthony Rudd and John Davenport). Kierkegaard After Macintyre: Essays on Freedom, Narrative, and Virtue. Chicago: Open Court. ↑ Hauerwas, Stanley (October 2007). "The Virtues of Alasdair MacIntyre". First Things. Retrieved 16 June 2014. ↑ After Virtue, (Notre Dame, IN: University of Notre Dame Press, 3rd edn, 2007) xii. ↑ After Virtue, 3, xiii. 1 2 The Tasks of Philosophy: Selected Essays, Vol. 1, viii. ↑ Paul Blackledge; Kelvin Knight (15 June 2011). Virtue and Politics: Alasdair MacIntyre's Revolutionary Aristotelianism. University of Notre Dame Press. p. 31. ISBN 978-0-268-02225-9. Retrieved 21 December 2012. ↑ "Précis of Whose Justice? Which Rationality?" in MacIntyre Reader, ed. Kelvin Knight (Notre Dame, IN: University of Notre Dame Press, 1998) 107. ↑ Whose Justice? Which Rationality? (Notre Dame, IN: University of Notre Dame Press, 1988) 12. ↑ Whose Justice? Which Rationality?, 361–362. ↑ Thaddeus J. Kozinski (2010). The Political Problem of Religious Pluralism: And Why Philosophers Can't Solve It. Lexington Books. p. 13. ISBN 978-0-7391-4168-7. Retrieved 18 April 2013. ↑ See pages 393–395 of Whose Justice, Which Rationality? 1988.